An alter ego is another self, a distinct second identity that can allow a person to lead a double life. Jane a meek java developer by day is a crime fighting superhero by night, etcetera. But is it truly that simple? Can you just slip from one personality to another by finding the closest phone booth to make a quick costume change? 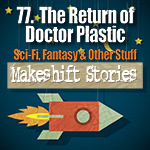 In this month’s story a man who is woken by his dog in the middle of the night can’t get back to sleep and finds himself reminiscing about the last conversation he had with his old friend Rob a would be graphic novelist who invented the super villain Doctor Plastic.